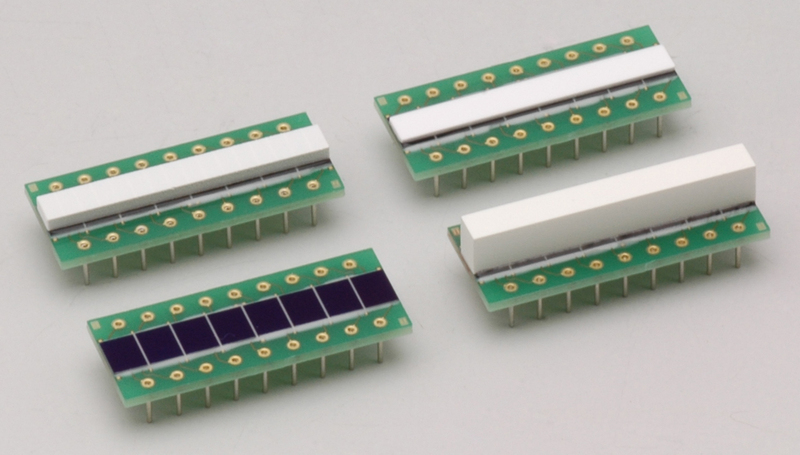 Hamamatsu Photonics has introduced two products to its range, the company's first high brightness deuterium (H2D2) light source (left) featuring a deuterium lamp that emits UV light at intensity 6 times higher than the company's conventional L2D2 range of lamps, and a back illuminated 16 channel PhotoDiode Array (PDA), designed for use in X-ray non-destructive testing applications. The L11798, L11798-01, L11799 and L11799-01 H2D2 light sources are available with either MgF2 or synthetic silica window for a choice of UV output. The stability remains excellent at 0.05% peak-to-peak, and the enhanced brightness does not compromise the lamp's working life, which is specified as 1,000 hours. The lamp only requires air cooling when used in the dedicated housing, and Hamamatsu has also produced an optimised power supply. The H2D2 source is suitable for a wide range of applications, including spectrophotometry, semiconductor inspection and film thickness measurements. The S11299 back illuminated 16 channel PDA, pictured below, uses flip-chip technology that allows the PDA to receive scintillation light from the back side of the array. This flip-chip approach reduces the need for gold bond wires and junction layers on the light input side, vastly reducing the risk of wire bond damage during scintillator mounting. The S11299 uses a slender board design, with a vertical height of just 10.2mm allowing for long and narrow arrays to be constructed. Additionally, the S11299 is suitable for dual energy imaging, by combining two arrays with differing scintillator thicknesses in a vertical structure. The existing S11212 series is suitable for this, and various configurations can be designed to match any application requirement. The S11299 series shows a large improvement in uniformity compared to the popular conventional S5668 array that has been in production for many years. The design also makes the series highly reliable, by reducing the risk of bond wire damage.